A game’s a foot and Mary Russell and Sherlock Holmes are on the case! In Sussex, Mary Russell is about to turn 21 and come into her sizable inheritance. On a whim one night, Mary sneaks away to London in search of her long time friend and mentor, Sherlock Holmes. When she meets up with Holmes on that dark London night, she nearly puts her foot in her mouth, but before she can cause herself too much embarrassment, Holmes cuts her off. But in doing so, he mistakenly insults her and she storms off into the night, anxious to be out of an uncomfortable situation. Come morning, Mary finds her way into a tea shop where she runs into an old Oxford acquaintance, Veronica Beaconsfield. Veronica has been working for the New Temple of God, a group whose mission is helping the poor and unfortunate women of London. Veronica convinces Mary to come to some of the Temple’s meetings and since she is in want of something to distract her mind, she agrees. At the Temple, Mary meets the charismatic Margery Childe whose interests lie heavy on women’s suffrage and religion. Mary can’t help but be drawn in by Childe, she is electrifying. Suddenly, women from the Temple start turning up dead….some murdered and some died from curious ‘accidents’, Russell smells a rat. She seeks Holmes’s advice and guidance on the case but discovers their relationship has taken an unprecedented change. Unsure of how to react to the shifting feelings, Russell and Holmes throw themselves into the quest for logic…..a murder case. But the closer Russell comes to getting answers about the dead women, the more convoluted the case becomes and Russell herself becomes the object of the killers dark designs. Will Russell and Holmes solve the case before it’s too late? A game is certainly a foot. I absolutely adore this series. I read The Beekeeper’s Apprentice last September and loved it. I simply had to read the next book in the series. One thing I especially like is Mary’s character. I love Mary. She appeals to many different readers partly because of her age. She is young (only 21) but yet so comes across as older, she is not juvenile. I think this alone makes her appealing to a wide audience demographic but it is especially important when the romantic relationship between Holmes and Russell develops. I am not troubled by the age difference at all, initially I was worried that I would not be able to envision the two as anything other than platonic, but I was wrong….romantic love between the two was seamless. Holmes seems younger than his 59 years and Russell older than her 21 years….that to me is the mark of well developed, classic characters. But besides her timelessness, she is also smart, funny, brazen, and fearless. I love how unconventional and spunky she is. Readers will admire her without question. 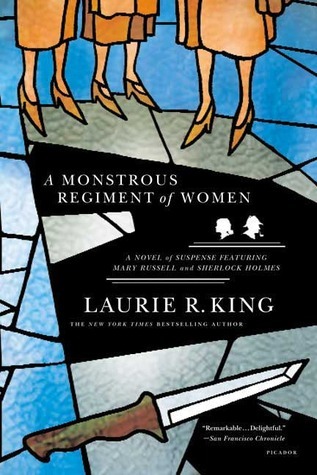 I have read a lot of Sherlock Holmes inspired detective novels, a fair few with female detectives (Maisie Dobbs, Maggie Hope, Amelia Peabody), and this series remains my favorite. I like all these women detectives for different reasons, but Russell is the one I identify with the most. She is detail orientated, practical, analytical, calculating, and yet has a flair for the dramatic. I like detective novels that are a little more intelligent and witty, and this series fits the bill. If you are a fan of Downton Abbey you might also enjoy this series since it is set at the turn of the century and beyond. Though this novel is set in London, the ‘home’ of Holmes and Russell is in the country, Sussex Downs. I enjoyed many elements in this novel as well as the pace of the book. However, I think Russell and Holmes are at their best when they are together and for me, they were not together enough in this book, for that reason alone I liked the first book better. When they are together they play off each other so well and I enjoy the verbal sparring. Some of the theological discussions between Russell and Childe were a little intense and dry for me, ironically I began as a Religious Studies major in college, but that doesn’t mean I love to debate religion and gender studies 24/7 :). I liked the intellectualism of the novel but I was looking for more of a mystery, not a theological lecture. But that said, this is a solid, entertaining follow up book in a stand out series. I can’t say enough good things about this book and the series as a whole. King isn’t afraid of putting her characters into unique situations and is willing to touch on sensitive subjects such as religion. She clearly spends time researching the historic period, religious, political, and social issues of the day. Her attention to detail is effortless and will keep readers salivating for more Russell and Holmes!